Sylvia Ramsey is a 17-year bladder cancer survivor who uses her experience to both shape her writing and advance cancer awareness. She offers multiple ideas for marketing and compares the indie and traditional routes. I am a cancer survivor of 17+ years. I have been writing for years. I have had by-lines, feature articles, short stories and poetry published since I was about nine years old. I was reading at an open mic, and the editor of a small publishing house liked my poetry. My first book, Pulse Points of a Woman’s World, was thus published. 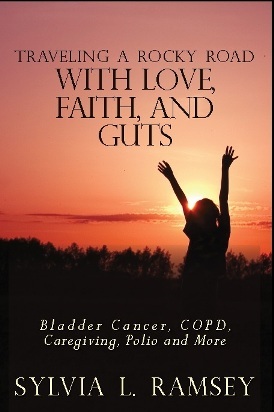 Because I had been working for several years to establish a foundation for bladder cancer, I was giving all my proceeds from my royalties toward this endeavor. After a couple of years, the publisher decided to return the publishing rights to me because of what I was doing with my royalties. That was when I decided to become my own publisher of my books. The latest book being Traveling a Rocky Road with Love, Faith and Guts. It doesn’t seem much different than using a traditional publisher. Regardless of the route you go, you must still do you own marketing (unless you have lots of money to hire a publicist). That holds true both ways as well. I have used about every way you can think of from book signings, to a webpage, press releases, radio and television appearances, blogs, interviews, an Authors’ Den page, an Author Central page, email, book trailers, presentations on bladder cancer and listings on several websites. Julie Weishaar, who has a small business marketing consulting business called New Horizons 123, is helping with this new book. She created my book trailer and is currently doing several things to promote it. I would be careful to not spam. I could write a book on that. I was lucky because of my background in communications and art. Since I had been using a computer and had my own since the mid-eighties, the formatting and illustration work was fairly easy. I would say the area I have learned about most is the marketing and publicity, but I still have a lot to learn. Nothing I can think of except that I wish I knew in the beginning what I have learned since day one. I don’t think traditional publishers are doing as much as they used to, and the author has to sell a lot more books to make much off the royalties. They still have to do all the leg work. My advice would be to learn everything you can about marketing books. Right now, I am launching this newest book that was just released. I have a biography and a fantasy novel waiting on the back burner. I don’t worry about only writing books in a certain genre; I tell the stories I have to tell and I have a passion for them. Sylvia’s writing is natural, honest and straightforward, reflecting real-life experiences for the educated reader. You can Google my name, or you can find me on Authors’ Den, Amazon, or on my blog.